Click the Properties button and respond to the UAC prompt. Select Internet Protocol Version 6 (TCP/IPv6) and click Properties to open the Internet Protocol Version 6 (TCP/IPv6) Properties sheet (see Figure 1). Figure 1. IPv6 properties of a network connection. Configure the IPv6 settings for the network connection as desired. Obtain An IPv6 Address Automatically This specifies that the physical or logical interface associated with this connection uses stateful or stateless address autoconfiguration to obtain its IPv6 address. Obtain DNS Server Address Automatically This specifies that the physical or logical interface associated with this connection uses stateful address autoconfiguration (DHCPv6) to obtain the IPv6 addresses of preferred and alternate DNS servers. IPv6 Address Type the unicast IPv6 address you want to assign to the physical or logical interface associated with this connection in colon-hexadecimal form. If you need to assign additional unicast IPv6 addresses to the interface, click the Advanced button and then select the IP Settings tab. Subnet Prefix Length Type the subnet prefix length for the IPv6 address you assigned to the physical or logical interface associated with this connection. For unicast IPv6 addresses, the subnet prefix length should always be specified as 64. Default Gateway Type the unicast IPv6 address of the default gateway for the local IPv6 subnet in colon-hexadecimal form. If you need to specify additional default gateways, click the Advanced button and then select the IP Settings tab. By selecting Use The Following DNS Server Addresses, you can manually specify IPv6 addresses for a preferred and an alternate DNS server to be used by your connection. If you need to specify additional alternate DNS servers, click the Advanced button and then select the DNS tab. 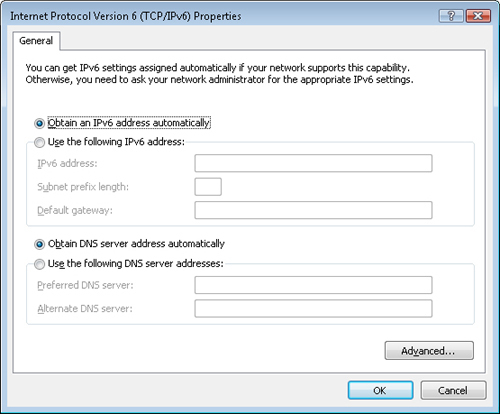 The remaining settings on the DNS tab have similar functionality to those used for configuring IPv4 address settings. The Advanced TCP/IP Settings does not have a WINS tab because IPv6 does not use NetBIOS for name resolution.